There are dozens of formations on the registers of the Hashd Sha'abi Commission. 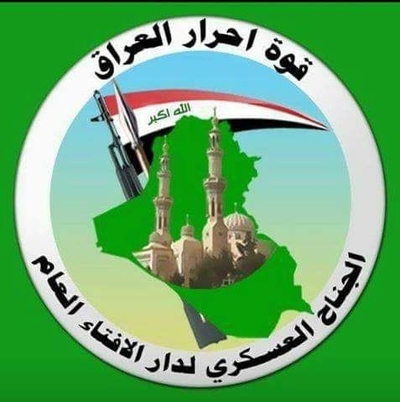 One of them is the military wing of Harakat Ahrar al-Iraq ('Movement of the Free Men of Iraq'), which is itself linked to the Mufti of Iraq Mahdi al-Sumaida'ie and his Dar al-Iftaa' al-Iraqiya (a Sunni religious body). To discuss the history of Harakat Ahrar al-Iraq and its military wing, I interviewed Anas Mahdi al-Sumaida'ie, who is the secretary general of Harakat Ahrar al-Iraq. 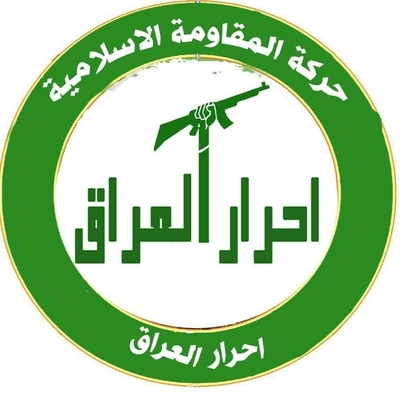 An emblem of Harakat Ahrar al-Iraq. On top: Harakat al-Muqawama al-Islamiya ('Islamic Resistance Movement'). In centre and on bottom: Ahrar al-Iraq ('Free Men of Iraq'). Q: When was Harakat Ahrar al-Iraq formed and what was the reason for the formation? A: Harakat Ahrar al-Iraq was formed under the name of Quwat Ahrar al-Iraq ['Force of the Free Men of Iraq'] on 14 June 2014 CE according to the fatwa of the Mufti Sheikh Dr. Mahdi al-Sumaida'ie, the mufti of the Republic of Iraq (may God make him mighty) on the necessity of enlisting and defending Iraq. Q: And Quwat Ahrar al-Iraq fought in Anbar in the beginning? A: No it was formed in Baghdad and the first battles were in Tikrit and Baiji, and then in Anbar, beginning with the liberation of the al-Sufiya area. Q: In addition to these areas, where as Quwat Ahrar al-Iraq fought in order to liberate the homeland from Da'esh? A: In Anbar: al-Hawz area, al-Mal'ab, Hit, Haditha, al-Baghdadi, Jazirat al-Khalidiya, Jazirat Rawa, Rawa, Anah and Rutba. Salah al-Din: Tikrit, Baiji, Shirqat. Kirkuk, Mosul, Qayarra and the left-side bank [i.e. area to the east of the Tigris River] and Rabi'a [Ninawa countryside], as well as Baghdad, its belt and al-Mashahadah. Q: And the number of martyrs is known? A: 250 martyrs, and more than 700 wounded. Q: What are the main activities of Harakat Ahrar al-Iraq currently? A: Currently Quwat Ahrar al-Iraq holds land and undertakes obligations of protecting the areas in order to preserve the security stability. Q: And when did Quwat Ahrar al-Iraq become registered with the Hashd Sha'abi Commission? A: The force was registered in the Hashd on 8 November 2014 CE. Q: But the forces doesn't have a brigade number within the Hashd Sha'abi Commission? A: We have a brigade number officially established in the Hashd Commission: Quwat Ahrar al-Iraq 86. Q: Ah. So you are the 86th brigade in the Hashd Sha'abi Commission? Q: Why does the force use the name of the Islamic Resistance? Did the Iranian friends help you in matters of training and arming for example? A: We have used the name of resistance because we are a part of it and the Mufti was the first who launched the jihad in 2003 CE against the American occupier. Q: So you have no link with the Iranian side. A: No one helped us, but rather they were supporting us morally and supporting our steps. And they were supporting our conferences concerning the force and movement. And in particular when we nominated candidates for the Parliament, the candidates affiliated with the movement were supported materially. Q: Yes. But I mean who supported you exactly? A: No one ever supported us. Self-reliance from charitable people of the people of Iraq. Q: I see. Were any candidates from Harakat Ahrar al-Iraq elected? A: Yes, one of the candidates affiliated with the movement obtained more than 13,000 votes in Ninawa province but regrettably the votes were taken after modification and the great conspiracy in the elections is not hidden to you sir. Q: So currently there is no one from the movement in the Parliament. A: We don't have an MP in the Parliament. Q: Currently how are matters of salaries and rights of martyrs for fighters of the movement proceeding? Q: Yes, so not all the fighters affiliated with the movement are registered with the Hashd Sha'abi Commission right? A: No, all are registered with the Hashd Commission, but most do not have salaries. And we are working on these matters, and there are attempts that we hope from God will be accomplished in the coming days.